Logan started soccer back this past weekend and he improves every season! He's really learning how to follow the ball. He also played goalie for the first time since he was 4! He was on top of his game. This is the dress that Brynn was supposed to wear for Easter. However, she looked kinda funny in it being a newborn and all. Plus, we end up just laying low this year and didn't go anywhere for her to wear it. I looooove the dress so I had to get pics of it anyways. She's filling it out much better now! She loves it when I give her kisses. Brynn is very sociable. Just talk to her and give her attention and she is usually happy. Just a smilin' and a talkin' right back!! Is officially in full swing! So far, she has been sleeping in our room on my chest most of the night. During the day she's either been in her swing or her bouncy seat to sleep. This past Friday night I realized this was no longer going to work out for our family. We attempted to have some of the people from Josh's work over and it didn't work out so well. I was not able to relax and conversate with adults while trying to get Brynn to sleep. The very next day I began trying to work on a naptime/bedtime routine. I thrive on these schedules and babies do too. Plus it makes it easier for people to watch them if they know what to do and I feel better knowing she'll be ok with out me for a bit. I realized that if I wanted to enjoy the summer and our usual grill outs something had to be done. With Logan I didn't even attempt to get him in his own bed til he was 5 Months! How did I do that!? So how did we fair you ask? Well I started with her first nap Sunday morning and within about 15 minutes of squirming she had put herself to sleep ! For a whole hour! I'm trying to establish a naptime routine so that she knows when we sit down to read in her rocking chair she's about to take a nap. Second nap went even better...slept for an hour and a half! Last 2 naps...not so good. The end of the day is usually her fussy time anyways and I think that played a role in it being more difficult. Finally got her down around 7 and she stayed in her crib til 5:30 AM!!! Waking up twice to eat and then right back to bed!! I am so proud of her! I, however, did not sleep as well because I was staring at the monitor all night making sure the little red dots weren't moving. The second day started out ok but by that evening at 8 I had given up! She slept on my chest again. This is her not wanting to sleep! Today has been much better. Thank Goodness!! She's in her crib right now and has been for an hour and a half! Only squirmed for about 20 minutes. Hopefully I will continue to have good news to report and I'll get used to not having her in our room. 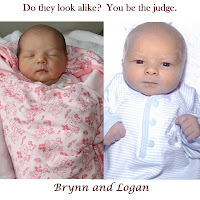 Some people didn't think Brynn looked like Logan when he was a baby. There are definite similarities, especially in some of their expressions. Both of these were taken the day after they were born. So what's your take? I, personally think they look almost identical except for the hair and their coloring. Both look like Josh when they were babies but, Logan I'm told is starting to favor me more. So interesting to see how they grow and change. Can't wait to see how Miss Brynn will change!